Col. Anthony Lee, commander of Singapore’s 188th Squadron, and Rear Adm. Thawatchai Muangkham, commander of the Thai Frigate Squadron, open the June 1-9 war games at the Sattahip Naval Base. The Thai and Singaporean navies joined up for the Singsiam joint naval exercise. 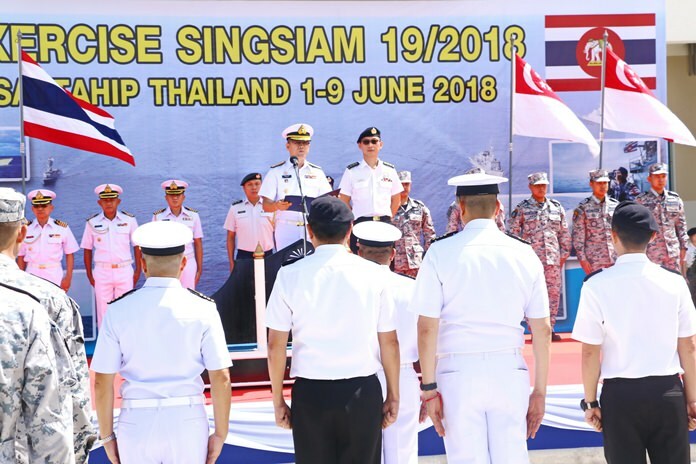 Col. Anthony Lee, commander of Singapore’s 188th Squadron, and Rear Adm. Thawatchai Muangkham, commander of the Thai Frigate Squadron, opened the June 1-9 war games at the Sattahip Naval Base. Exercises took place in the Gulf of Thailand between Sattahip and Koh Samui. 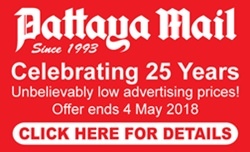 Held for the 19th time, the Singsiam games give Thai forces a chance to improve their strength and training, including how to detect submarines, battle on the surface and defend air attacks. It also teaches the crews to cooperate with foreign allies. This year’s exercise included aviation assault and support, defense at sea, target shooting, inspections, rescue missions at sea in the air, coordination, disaster prevention and more. Ships and aircraft used included the Super Lynx Helicopter, DoMier 228 aircraft, F-27 MK 200 striker aircraft and the RSS Vigour, RSS Sovereignty and more.